Have you noticed that you don’t need to switch on heating if its already quite warm outside? If you have, you probably also noticed that it happens already when outside temperature is still several degrees below your inside room temperature. That temperature is your house balance temperature if you don’t need extra heating anymore. It does not mean that you are not heating at all. It means that all your home appliances like light bulbs, ovens, toasters, 56-inch plasma tv-s, hot wives etc. are just radiating enough heat to compensate your house’s heat loss through walls, ventilation etc. Yes, one hot wife can heat your house as well as 100 watt light bulb! You may ask what to do with that balance-temperature? It is really simple – in general you have to start heating your house if outside temperature falls below balance temperature. It would be ideal starting point if your house is really small and with thin paper walls but usually it is not. It has some mass, heat capacity, inertia. So you can actually delay heating for quite some time if you have heated up your 100 ton concrete bunker. Question is only how long? To answer that question – how long can we delay heating if outside temperature has fallen below balance temperature – I have to to start by lending and translating some wisdom from Kredex web-page which is in Estonian. That web-page generally contains information about something what if translated is called “degree-day”. I will re-define it with my own words as: It is a 24 hour period where average outside temperature is one degree less than balance temperature of your house. For example if your house balance temperature is 15 degrees and you had in average 10 degrees outside for 2 days (48 hours) it means that sum of degree days is: 2x(15-(+10))=10. If you have -8 degrees outside for two days then sum of degree days with 15 degree balance temperature is: 2x(15-(-8))=46. In this point it would be good to mention that it probably does not matter what scale you are using – celsius, fahrenheit, kelvin or something else until you don’t mix them. These “degree-days” are really good for comparison between different months and years as they are taking into account temperature relative to your houses balance temperature and number of days. You just have to summarize these “degree-days” for some period, lets say one month to understand how cold the month really was. When you take a sum, take into account only days when average temperature is below your house balance temperature! With higher temperatures you end up with negative numbers and summarizing them will end up with incorrect result. Compare result with sum of degree-days on different month or same month different year to understand the relative difference. Illustration below. Now compare HEATING CONSUMPTION on these months. Ideally number of “degree-days” compared with your heating consumption should have more or less same ratio. I got following picture from the apartment building where I live and it is far from ideal. It has some weird-looking peaks what look like results of poor regulating. Red line marks house renovation. 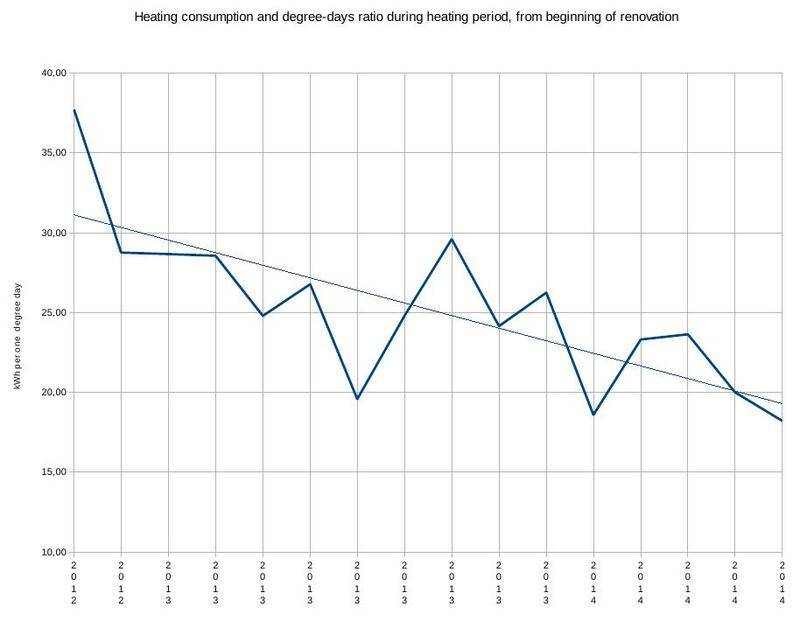 Its clearly visible that after renovation heating consumption falls dramatically. 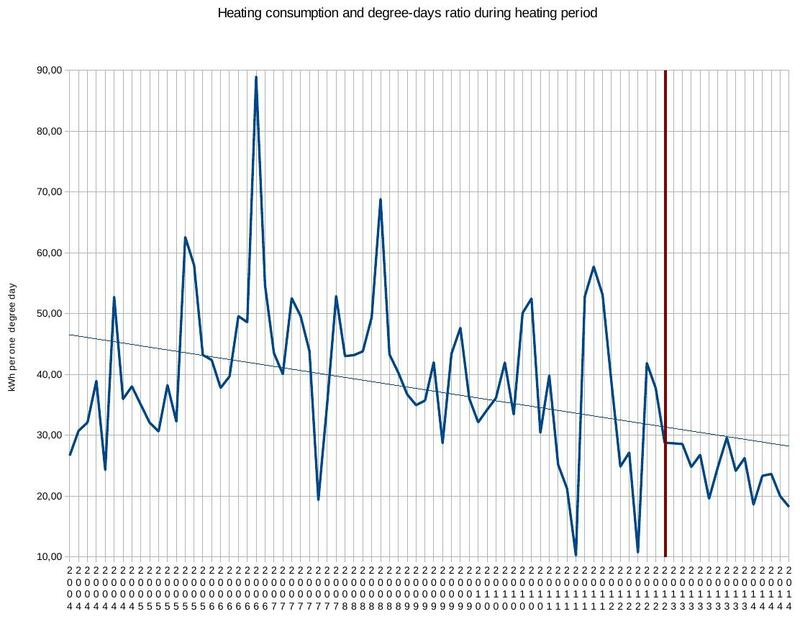 Although after renovation (red line) heating consumption dropped a lot, some peaks still remain. Bigger picture below. To keep same trend and save energy I intend to implement heating delay, to smooth out these peaks I intend to get my apartment heating regulation under precise control. Now if we would use degree-days to calculate heating delay (how long can we delay heating if outside temperature has fallen below balance temperature) you could delay heating one day or two days or three or more. By this moment you should have got it also that days are too big steps and obvious solution would be to split these days into hours. Its same thing as degree-day only for smaller period. For example you get one degree-hour if one hour average outside temperature was one degree below balance temperature of your house. With these degree-hours you can define heat capacity of your house. With “define” I mean that if you have computer to do the calculations and implement heating delays, you can take that heating capacity number from the sealing and adjust it if you get too cold or something. I know that in my house inside temperature stays normal even if there have been 10 degrees Celsius outside for 3 days. As balance temperature in my house is 13 degrees, I calculate number of degree-hours as follows: 3 (days) x 24 (hours) x (13-(+10)) = 216 degree-hours. So in general I will take 200 as a number to start. I intend to use this number 200 as a number from where “countdown to heating” starts if outside temperature will drop below balance temperature. Lets say heating is off and last hour average temperature dropped to +5. It is 8 degrees less than balance temperature, so I will subtract 8 degree-hours from 200 and so on until I get to zero. Then its time to switch on heating as most probably house has run out of accumulated heat. If outside temperature rises to balance temperature, switch off heating. If it raises couple of degrees more, house starts to accumulate heat and its time to start adding degree-hours instead of subtracting until you get full “buffer” again. For all that you need to collect temperature data. if you don’t have it, it is time to start collecting it. 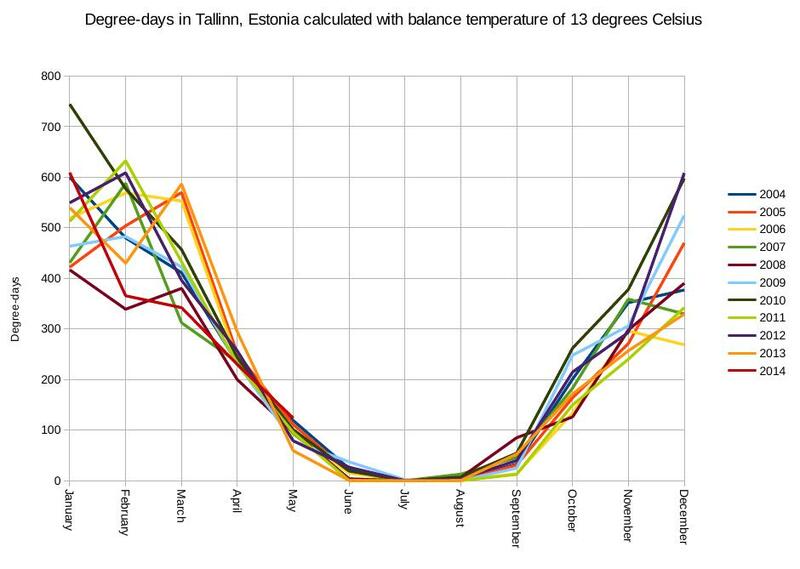 If you collect data, do not calculate and store degree-days or degree-hours as balance temperature may change. I suggest to store average temperature for each day and hour and do calculations later on the fly.